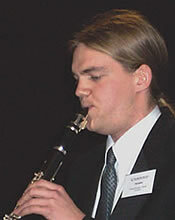 David Campbell (distinguished British Solo clarinettist) David selected two Craven Model mouthpieces. After a very successful Clarinet Convention at the Royal Welsh College of Music (led by Leslie at which David Campbell was the guest artist) David Campbell tried and selected two Craven Model mouthpieces and was delighted with them. David said: “Leslie’s mouthpieces really suit my English style of playing, allowing the legato and flexibility I like in a sound combined with all the other characteristics such as easy staccato, focus and projection. High altissimmo is reached with ease and I thoroughly recommend these mouthpieces to both professionals and students alike. Recently Bradford Behn has been working on a new material for the mouthpieces and now they are available in a resonant hard rubber made by Brad himself which provide a sound with more projection and focus. Currently they bear no Craven/Behn logo as they are completely new prototypes but later batches will have the familiar Craven Behn stamp. Both models are beautiful but currently Leslie only has the new design in stock as the Zinner blank based mouthpiece will be phased out. To try the Craven model either email for further details or arrange a consultation with Leslie to select the best one for your style of playing from a selection of mouthpieces. Ideally, Leslie prefers not to send mouthpieces by post (although this can be arranged) but prefers to assist the player select a mouthpiece and this is done in his studio at home. A consultation will take about half an hour and is part of the service, incurring no extra cost. All the mouthpieces are almost identical in characteristics but small timbre changes between the various mouthpieces offer different colours according to the player’s personal preference. Some players prefer more harmonics in a sound and others want a smooth round sound – both these characteristics are available with the Bradford Behn / Craven model. Projection of the sound is achieved with ease but the Leslie Craven Model is versatile and can also be used for chamber playing as well as in symphonic and operatic music. The craftsmanship of Bradford Behn is second to none and this is borne out by the fact that since changing to Behn mouthpieces Leslie has used them exclusively, in search for this, in his opinion, the ultimate. Each mouthpiece is hand crafted to the highest standard and they are limited in availability and numbered. They are not mass – volume produced and each order is treated with personal service by Leslie. 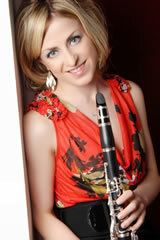 Leslie uses the Behn/Craven mouthpiece on all his recordings available from the store. Contact Leslie and arrange for a trial of the mouthpieces. Payment will be required in advance if ordering by post. Mouthpieces will be sent on a trial basis for one week and provided they are returned unblemished within 7 working days, the total amount (minus a £10 handling and P&P charge) will be refunded. Damaged mouthpieces will not be accepted by return and will be shipped back to the customer. Cheques / Postal orders should be made payable to Leslie Craven. The price is £210.00 plus postage and any surcharges. For U.K. residents this is £10 00. The cost of shipping within the EU, inclusive of tracking and insurance, is £15 00. Customers from outside the EU will need to contact Leslie with regard to shipping costs. If you would like to reserve a mouthpiece for trial or come to Leslie’s studio please contact him. All the above players and many more are delighted Craven / Behn mouthpiece players. Below Alison Turriff a former student of Leslie’s who Won every prize available at the Glasgow music Festival playing a Craven mouthpiece. Joseph Pacewicz – another satisfied customer is Eb clarinettist of the Royal Scottish National Orchestra who bought a Bb mouthpiece plus a matching Eb mouthpiece made to special order. 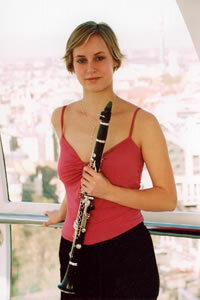 Jane Calderbank – freelance with the major orchestras such as the L.S.O., Philharmonia and Royal Philharmonic in London(pictured) writes: â€œWhen I first tried one of Les’s mouthpieces, it was on the day of a concert, and I took to it so much that I actually used it in the concert that same evening. “I immediately found more resonance and flexibility in my sound, allowing me to use a wider range of colours and blend with other players more effectively. I am able to take it further in louder dynamics, without hitting a limit as other mouthpieces I have played tend to. It is also much easier to achieve a really clean articulation. Amanda Thompson – a customer in Japan. Amanda bought a mouthpiece about 6 months ago and likes it so much she is ordering a second: “I have been playing the mouthpiece with a variety of reeds: Marca, Rico Grand Concert Select and some different Vandoren types. I have been getting very satisfying results with Vandoren 4s finished down a little. Now there is lovely response in upper registers. Also staccato feels like playing a new instrument”. Kevin Hurst Kevin bought 2 mouthpieces a while ago and has found a new range of colours using them. 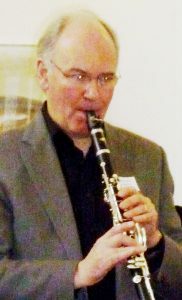 Kevin is a freelance soloist and gives frequent recitals throughout the U.K.
Idris Harries freelance clarinettist Idris has emigrated to Australia but before he went he bought a second mouthpiece and is delighted – see guestbook page. 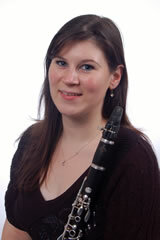 Rebecca Owen writes: “I am absolutely delighted with my new Les Craven model mouthpiece. The clarity, resonance and tone colour I achieve with it is superb, and I can confidently say that I have not come across another mouthpiece that enables all these qualities quite so flawlessly in all acoustics. I really like the mouthpiece! In a way it “tracks” more safely what and how I want to play. Intonation in the upper range feels very secure, the feedback loop of listening and correct intonation is somehow in a major way improved above what I was used to. A more balanced and enjoyable tone certainly helps this loop too. The beautiful tone and intonation stability is an incentive for playing slightly heavier reeds (3.5). The latest success of Lee Mottram – he won the National Eisteddfod Blue Riband a prize worth £3000 was achieved on one of the Leslie Craven Model mouthpieces. 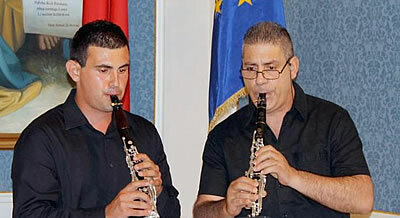 Among other players to buy one of the Craven mouthpieces is a clarinettist from Malta – Lino Pirotta – freelance Clarinettist and leader of the Denner Clarinet Quartet. “Playing on a Leslie Craven mouthpiece I discovered a new world of harmonics.The creamy dark sound it makes gives me new pleasures in Clarinet playing. My Selmer clarinets came to life, with the ease of blowing, and the crisp staccato I can produce is incredible. Well done to a real and dedicated artist”. Other distinguished customers include Alison Turriff who won the Glasgow Music Festival competitions (- see teaching page). 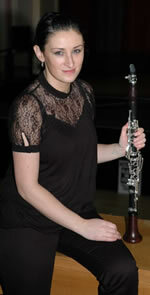 Alison Turriff (winner Glasgow Music Festival); “Les your mouthpiece played a huge part in my success at the Glasgow Festival”……. Since purchasing the first mouthpiece, Alistair has returned and now owns 3 Craven Model mouthpieces !! He must like them a lot !! 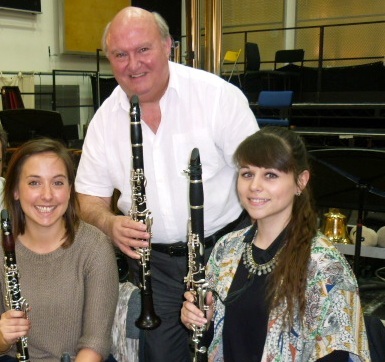 Peter Fielding – Welsh National Opera- “I have two of Leslie’s mouthpieces and can recommend them highly to Pro players and students alike”. 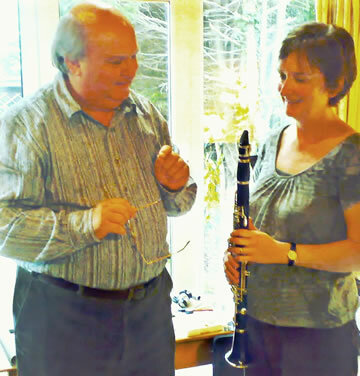 Tom Jackson – freelance clarinettist featured on Expressions disc CC0059 , teacher , composer : “I really like my mouthpiece it does everything I need”.